Every now and then we get a newish Bingo site that comes along and exceeds expectations. Bingo Street is one of those sites. Everything about it is set up to represent a community. The back drop is all about local streets, the community spirit is all about players integration. Even the wording is different. You’re not a new player, you’ve “just moved in”. You’re not a newbie, but “new to town”. The Bingo is a the same as it is in most other sites, but that connection that they build into their site allows you to feel part off it. It’s cute, quaint and totally appealing. In short, what they have done is take the usual comradery you’d get from an offline Bingo hall, and brought that to the screen. That makes it different and in our books, well worth further investigation. No agency fees, no council tax, just great games and a brilliant place to play them. The only thing stopping Bingo Street getting a perfect 10, is the limited slots on offer and the high wagering requirements for slots they do offer. Is it perfect? Close, but what’s missing is more than made up with community spirit. Would we recommend? YES, this is our favourite place to play. Bingo Street looks great, plays really well and offers large prize pots. It might look like just another Bingo site on the surface, but underneath is a very clever, very welcoming community site that is all about the players or tenants as they call them. Something different with a close feel is rare in this day and age. The Free games are available to all players, so if you have an account (funded or not) you’ll be eligible to play. The Free play games usually come in the form of a Bonus game, or a special that you as a player will be invited to. There is no such thing as a free supper, and at B-Street you need to know what you are accepting when you take your bonus funds. Likewise, you need to know what and when you can withdraw your winnings. Full details will be in their Terms & Condition’s on the bottom of their homepage. Maximum withdrawal amount: No withdrawal limits, but payments may be staggered. Proof of ID is always needed when withdrawing funds. They might ask for a photo ID, proof of address, copy of Credit Card details and notarised documentation in extreme cases. 18+ players only. *Welcome Bonuses refer to New players only. Wagering requirements apply. Bonuses, Games and Wagering requirements may change. Please read full T&C’s before playing. 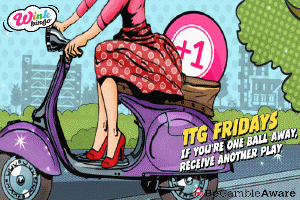 Everyone deserves a second chance, especially in Bingo, so head over to Wink Bingo’s brilliant 75 Ball Bingo 1TG Friday games. 1TG winners in the bingo rooms “For You Friday”, “Open All Hours” and “Piece of Cake”. Deposit can be withdrawn at any time. Withdrawal restrictions and T&C’s apply. 18+ players only. Promotion open to UK players. Read T&C’s before depositing. Welcome to the Friday Big Five from Costa Bingo. Five £1,000 Jackpots and Five shots at a weekend changing pot. The 75 Ball games play every Friday at 7pm, 8pm, 9pm, 10pm and the last game at 11pm. You need to have deposited within the last 6 days to qualify for the Big Five. The pots get bigger as the night goes on, but full T&C’s apply. 18+ players only. Registered players only. Deposit restrictions apply. Read T&C’s before depositing. Head out to the Gold Room for the fabulous Paddy Power Spring Boost Enhanced Bingo games. Two hours of fabulous Boosted games between 8pm – 10pm every night throughout April. Enhanced prizes up to a massive £20,000 total each evening, with tickets between 5p/10p/15p/20p. You need to be registered at Paddy Power to take part in this Bingo promotion. T&C’s apply. 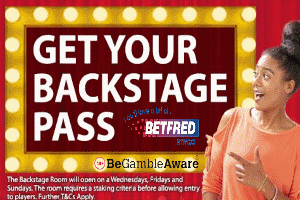 The Backstage Room at Betfred Bingo is open three days and week and it’s worth getting your Backstage pass. This is what VIP Bingo looks like, so stake £2,50 from Mon-Tue on Bingo tickets and get the Rock Star access for Wednesday. Full T&C’s apply. 18+ players only. Promotion open to UK players. Stake requirements before access. Read T&C’s before depositing. Here’s a £10,000 late night early riser pot to keep you awake through the darkest nights. Head over to the Bingo Café from midnight to 6am and enjoy Vernon’s Bingo Roll On Bingo, 1TG and 2TG, BOGOF, Last Chance Saloon, and a £1,250 Bingolinx game. T&C’s apply. It’s time we all stood up and said “NO” to Racism. MyBingoBonus.com are having a "Say No" week and we’d love your support. 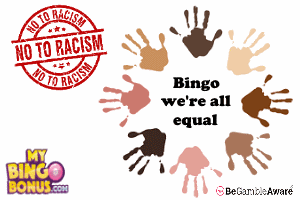 When playing online Bingo we’re all the same, it doesn’t matter what colour, creed or religion you are when you shout “HOUSE”, a winner is a winner and we’ll celebrate with you. Say NO to Racism starts here. 18+ players only. Promotions open to UK players. Always read T&C’s before depositing. Copyright 2009 - 2018 MyBingoBonus.com by Triple Hat Media Ltd.